On QEMU all works, but i'm can't test hub on EHCI port, but on real hardware i'm can't connect some devices to root hub, because i'm have only one device on root hub: external hub. I'm isn't connecting external hub: i'm haven't it. I'm sorry. That makes absolutely no sense to me. I was unaware that QEMU supported External Hubs with devices connected to this emulated external hub. However, I don't use QEMU a whole lot, so I can be a bit behind. ... but i'm can't test hub on EHCI port, but on real hardware i'm can't connect some devices to root hub, because i'm have only one device on root hub: external hub. I'm isn't connecting external hub: i'm haven't it. Again, sorry. I don't know what you mean at all. I'm said, that hub, i've detect is connected to one of ports of EHCI. 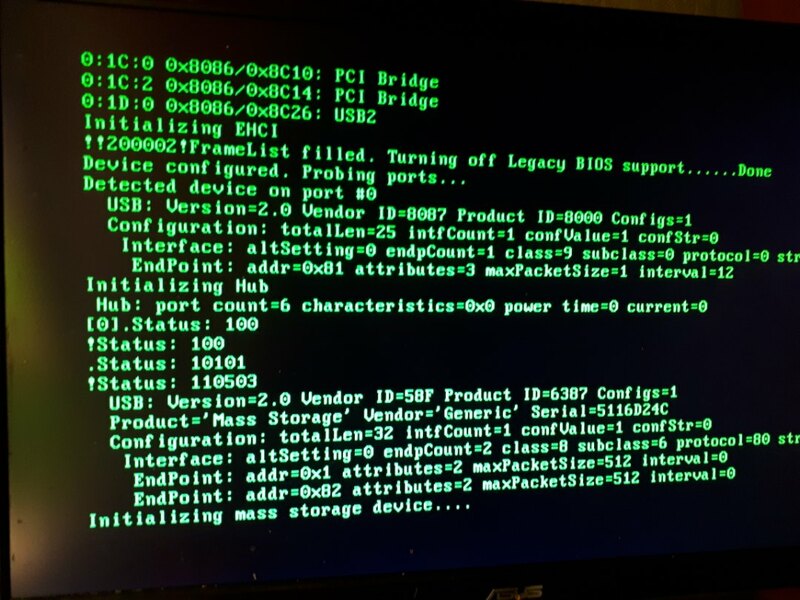 Just to clarify what Ben is saying, the USB "ports" that are inside your machine, connected directly to the motherboard, can be accessed by PCI memory and I/O reads and writes by the CPU. But, if you plug in an external USB hub, the "ports" on the external hub can not be controlled directly by the CPU. You must send USB commands to the external hub, and the external hub is responsible for controlling the ports on that hub. So, the code you write to reset a device that you plug directly into your PC is completely different from the code you write to reset a device that is plugged into an external USB hub. You do not need to create any USB descriptors to reset a device plugged directly into your PC, but you must create one or more Transfer Descriptors (TD) in order to reset a device connected to an external hub. This is also true for all USB versions, not just EHCI. Ben, thanks at lot! Now i've working(on real PC,QEMU,BOCHS) EHCI driver with hub, mouse and keyboard drivers. But on VirtualBox my EHCI didn't works! What it may be? I don't use Virtual Box that much, so I cannot speak for Virtual Box. Also, with that little bit of information, I couldn't even begin to tell you why... Sorry. Hi everyone! I've written EHCI driver and driver to some USB devices(Hub, Keyboard, Mouse, Stick). On QEMU, Bochs and real hardware my driver works fine. But on VBox my driver successfully intits the HC and trying to send control request to device. But, my queue haven't process ever. In debug mode i've see right values for HC. But it freezes. What it may be? Code listed above. Maybe its time I get out Virtual Box and see what is going on. Thanks. I will have a look at get back with you. My preliminary tests show that the controller isn't even making it to the TDs. Either the controller is stalled, the Queues are in error, or the TDs are in error. Since my code works on all other emulators and many actual machines, I am going to start to speculate that it is Virtual Box. I will continue to investigate. Either way, a fix is in order: my code or Virtual Box. Well, I found the bug. It is actually in my code. In some instances, I was not updating the "Typ" field in the QUEUE HEAD Horizontal Link Pointer field. I was leaving it zero which tells the hardware that the pointer points to a ISO TD when it really was pointing to a QH, needing a value of 01b in that field. Virtual Box must be more exact with these fields than other emulators and indeed some hardware. I am surprised with some of the hardware I was using didn't catch this, or it did and I didn't notice. Anyway, good job Virtual Box. The way that I found this out is that I have a DUMP CORE routine that I can call anywhere in my schedule. This will actually dump all of the registers, then dump the Async and Periodic lists as well as the TD's that are being executed. Makes for a very long log file, but if you know what you are looking at and looking for, you can find the error. In a few cases, my code "forgot" to update the "Typ" field and the log showed it. Can you add something like this to your code and then see what is actually happening? Just a suggestion. I appreciate the error catch. Thank you for catching it. I will update my HD image soon to reflect the fix. Hi, i'm cant do it. So, i've now know, that if i wont't place my qh after async qh, status is 0xC00C, else 0xE00C. I'm checked for Typ bits - all ok. I quickly looked over your code and nothing jumped out at me. I suggest that you create a dump function wrapped around some #define's so that you can "turn on" debug mode with a simple re-build. The following is the output of mine for the transaction to get the first 8 bytes of the device's descriptor. This dump happens for every transaction when in DEBUG mode. i.e. : For every transfer, descriptor request, Control request, Bulk request, whatever, this sequence gets printed to the log file. The "Before" is before I send it to the controller. i.e. : Just before it is inserted into the Queue. The "After" is after the interrupt has either fired, or I receive a timeout. horz_ptr = 0x0xxxxxxxx, typ = 0 (iTD), T = 0 <------- This showed that I was indicating an iTD when it should have been a QH. I suggest that you do something like this and I guarantee that you will find the error. I'm just wondering what you found out. Where you able to print a more detailed debug report? Did this help?